Today’s confession: I’m kind of a dress hoarder. I find a super pretty dress now and I just have to buy it! I mean how times how you adored a dress but had no occasion to wear it and so you didn’t buy it and then when you finally have a reason to wear a lovely dress, you have nothing! That has happened to me so many times that finally I just started to collect gorgeous dresses. For a long time, I spent most of my day in front of the computer editing (I still do) so I really had no special occasions to wear pretty dresses. But as I got older (sigh) and got invited to weddings, showers, etc… I found the need for an amazing dress collection. And honestly I just love pretty things so having a closet full of pretty things just kind of happened (don’t tell the hubs). So today’s post is one of those dresses. 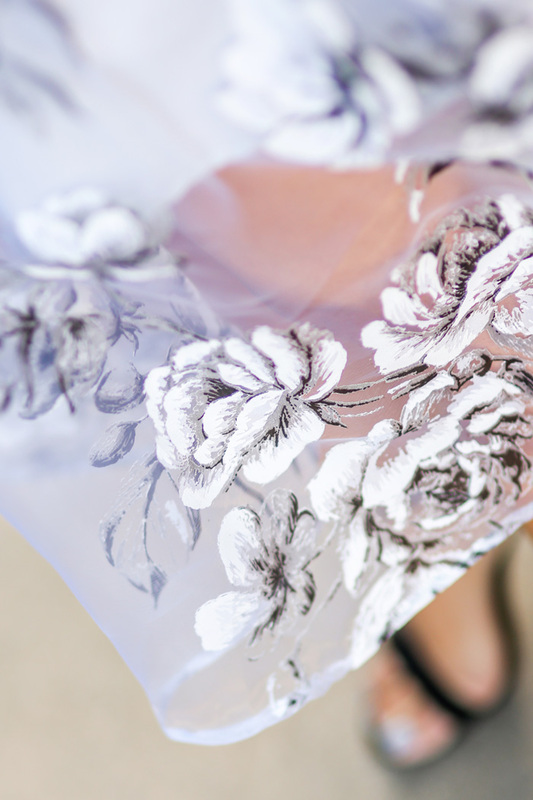 Seriously – organza, floral and off the shoulder in a great fit?! What more can you ask from in this gorgeous ASOS dress. I love their petite sizing because everything fits me so well – sometimes even a little too snug. This dress is so stylish and pretty – it would be the perfect dress to wear to that summer wedding! But hurry the dress is a part of ASOS’s exclusive salon collection so they only carry a limited number of quantities in each dress. I’m interested in this dress, but unsure as to which size to get- is it accurate to the size guide? Also, if you don’t mind, would it be okay if you told me your measurements and what size dress you ordered? It would be a massive help. Hi Lauren! I get size 0 Petite! I’m also super interested in this dress and I’m wondering what your measurements are? I’m about 5 feet tall, 100 lbs, 32 bust, and 24 waist. I’m debating between size 0 Petite and size 1 Petite. If you can reply back with your measurements or which size you think I should get, that would be amazing! Hi Tammy! I think we are about the same measurements! I got size 0 petite but it does run small and a little tight. My husband had to help with the zipping up lol. I would go for the size 1. You look great in this dress! I’m really interested in buying it but I just wanted to clarify the colour. On Asos it looks grey but here it looks lilac/pale blue. What colour is it?